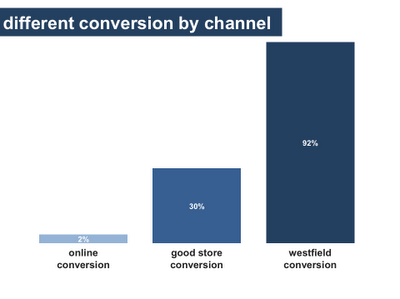 I love this Westfield slide showing conversion rates by channel. Impressive that 92% of people who walk into a Westfield mall make a purchase, if only we could get conversion rates like that on www.shoesofprey.com! That is pretty cool, however I be their store conversion, on a per store basis within the shopping center is around 30% (maybe less). Remember Westfield gets rent (and some rev share) but mostly rent... And they have stores like Woolies and Coles which sell daily essentails which would contribute highly to their "92%". I'd like to know the conversion rate of a shoe store like Peeptoe or ZU... That would be more relevant to you guys. I agree with Brad, I would want to know what the store conversion rate is. I have seen plenty of stores with no customers for long periods at a time. Large shopping centres, including Westfield, also often include the local post office, medicare, banks and pharmacies which is why many go there which would make their conversion stats so attractive. This doesn't necessarily translate to the specialty retailers. I, too, see many shops with very few, if any, shoppers in them, while the PO queues are often out the door. A big BOO for bad Australia Post service! Yes, I'd be very interested to know what Westfield's conversion rate would be if you took food, beverage and supermarkets out of it. Aaah the tale that statistics can spin. Of course consumers buy nothing much from Westfield - maybe the odd gift voucher. AND - I bet the local high street butcher boasts a 100% conversion rate.